The final stop on the tour winds up at the top of Battery. Marker 11 overlooks the location of the initial exploration on Fort Taylor in 1968. Taking the stairway from the Parade level to the second level and then climbing the metal stairway to the top of the Battery brings you to the South Curtain overlook. 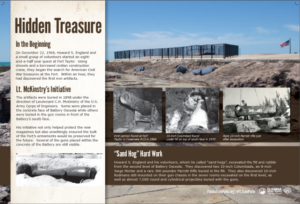 It was here that Howard England and his team of volunteers began to discover the “treasures” that had been buried in 1898 when Batteries Osceola and Adair were begun. At that time Fort Taylor still retained its entire complement of Civil War guns and ammunition. Every other coastal fortification from that era had been stripped clean of guns and ammunition over the years. But the relative isolation of Key West helped ensure that didn’t happen to the Fort. The photographs on the marker show several of the guns that were uncovered during Howard England’s 8 and a half years of excavation on and within the South Curtain. They include, from left to right, a 10-inch Rodman Columbiad, a 10-inch Columbiad, and a 300-pounder Parrott Rifle. All three of the guns pictured are still at the Fort and are on display within the casemates of the North Curtain in front of the “Big Guns” marker. Note the gun tubes buried in the concrete face of Battery Osceola right below the viewing area. You can see these by leaning over the railing behind the marker. Several were removed during the initial excavations, but five remain visible. Essentially, the contractor building Battery Osceola formed up a 15-foot wide by 30-foot deep section, filled it will gun tubes, and poured in concrete to provide additional protection for the magazines of Battery Osceola. To show how many guns were placed into the forms, an 8-inch Columbiad was recovered from the base of the southwest corner of the Battery over to your right. The gun had been placed in the form right on the original brick sidewalk and covered partially in concrete. When the sand and rubble in front of the Battery were removed, the gun was clearly visible.